Who wouldn’t want a private swimming pool? If you have one, you sure are lucky! That said, pool maintenance is a task that does require some serious work. In this article, we will give you some really cool tips to keep your pool crystal clear and squeaky clean. For those of you who don’t have much time on your hands, we recommend that you consider buying a home warranty. In case a major damage happens, you will be able to save a load of cash if you have an active warranty on your pool. For more information, do look into the coverage of a home warranty plan. Next, we’re going to give you a step-by-step guide on what must be done to keep your pool clean. This is a monthly routine, so you don’t have to worry about doing this every week. Before you get into the main steps of pool cleaning, skim the debris and any other particulate material floating in the pool. Some materials would float while some get settled at the bottom of the pool. Your first step is to get them all out. Start with scrubbing the walls of the pool and the floor too. Ensure that you use pool manufacturer recommended cleaners and vacuums. If the pH is incorrect, anybody who takes a dip in the pool could come out with skin rashes. Apart from this, an incorrect pH may also corrode the pool equipment. 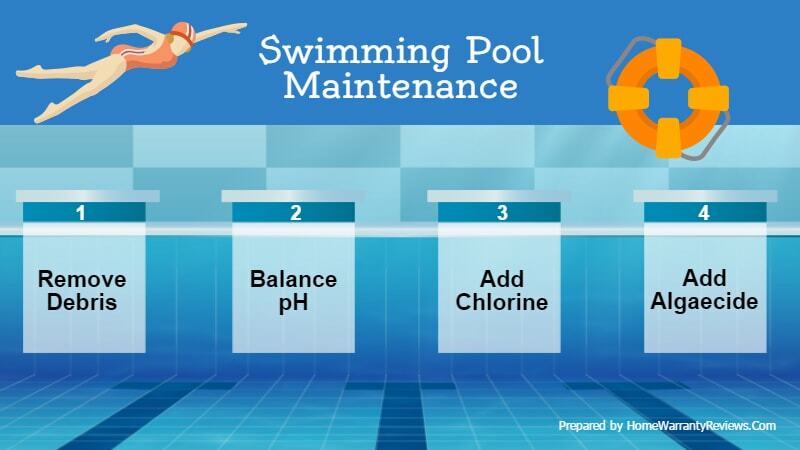 The parameters that decide a well-balanced pool are the alkalinity and calcium hardness levels. Many pool balancers are available in the market, you just need to follow the instructions given on the pack to get it done. These are available in most department stores and they come with easy-to-follow instructions. Algae are notorious because if left unchecked, one tiny colony can become an infestation in no time. These microscopic plants are best avoided by using algaecides appropriately. Algaecides are chemical mixtures designed to keep growth of algae in check. Add them to the pool weekly, and that should keep things in control. If you already have an algae invasion, then get products designed to quickly wipe out algae. But please do keep in mind that adding such a chemical would leave your pool unusable for a few days. Pool maintenance is a task that can be mastered with practice. It only requires following a set of steps precisely. That said, we cannot stress enough on the importance of protecting yourself while you are cleaning your pool. Ensure that you wear gloves and protective clothing while using chemicals and tools. We also advise you to strictly follow all the instructions given with the cleaning chemicals. Any mistake may damage your health as well as the health of those who dive into the pool. We also have a host of other articles on maintenance of various household appliances and general home cleaning and maintenance. We recommend that you go through them so that you can become a star homeowner who invites the envy of the neighbors. Good luck and happy housekeeping!